aimee bee: 10% off at PRINTOGRAPHY! 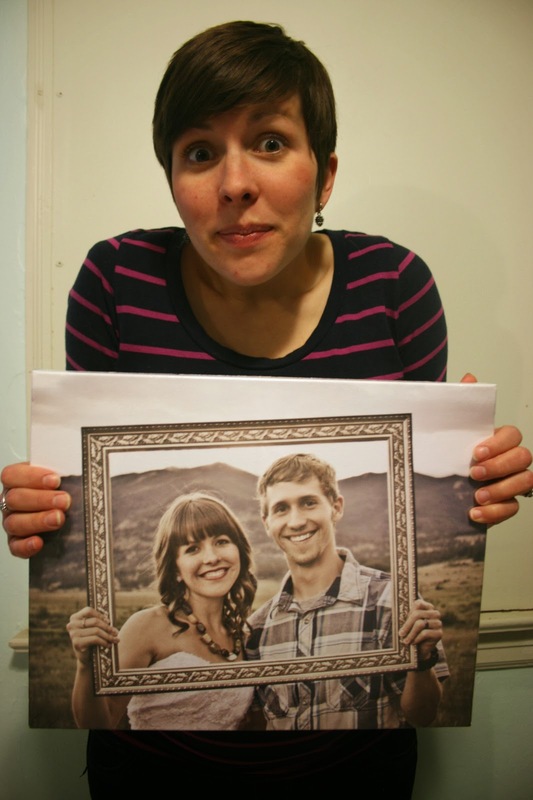 Last week I blogged about a new photo printing website called Printography. They kindly offered me an amazing opportunity to try out one of their 11x14 inch photo canvas wraps. Earlier this week my canvas wrap came in the mail and I absolutely LOVE it. I love it for so many reasons. One, it's us in the mountains. I'm re-wearing my wedding dress. And we're celebrating our third anniversary. Two, it's so well made. The canvas wrap is nice and thick on the sides. I've seen other canvas prints before but never ones as thick and durable as this one. Often times the sides of canvas prints are pretty thin, which makes the canvas sometimes flimsy. This one is great. Durable and well made. Three, I'm going to be honest. I was a little nervous. When I was in the printography edittng section, it gave me a little warning that told me my picture may turn out fuzzy. Originally I had my photo spread across the entire canvas so that the outside parts of it were on the side of the canvas. I was dead set on using this photo and didn't want to change, so I quickly adjusted it so that the photo would fit perfectly on the front of the canvas leaving the sides white. I was a little nervous that because of that warning our photo would turn out grainy looking, but it looks amazing! Not grainy at all. High quality and perfect. And four, I have ALWAYS WANTED A CANVAS WRAP LIKE THIS but I have been too scared/cheap to try it out. Now that I have one I can totally understand why people get these, and I would highly recommend Printography to try it out. (It also came in the mail super quick, too! It took about a week between the time I ordered it and the time it was dropped off at my front door). So that being said, I would highly recommend trying out Printography - especially because right now you can get 10% off when you use the code Launch10! Then, pick a category. (I chose weddings). Then click on canvas wrap. It'll give you all kinds of size options to choose from. (I think it could be really cool to make a canvas wrap wall with lots of photos in different sizes)! Click on the size of your choice. Once you do it'll ask you to sign in, create an account or continue as guest. I would recommend creating an account so that you can save your projects over time. Finally, it'll take you to the editing page. It's really user friendly. You can upload your photos on the right hand column and drag them into the screen. You can create a simple canvas wrap with just one photo (like mine) or you can also create a canvas wrap collage, text or fun designs. Then you order and go! And that's it. Super easy. Super fun. And great quality! Don't forget to use the code Launch10 for 10% off! And now I'm off to bed. Happy last night of February. Welcome March!